Daffodils, one of the first flowers of spring, are a large group of perennial plants which grow from bulbs. Many hundreds of varieties are available today ranging in size from 4 to 20 inches (10-50 cm) tall. Flower size can be anywhere from a half inch to five inches (1-13 cm) in diameter. Daffodils come in various combinations of pale and bright yellows, white, cream, shades of pink, salmon, apricot, orange and green. Flowers are most often single, consisting of the corona (cup or trumpet) and perianth (outer petals), but there are double flower varieties in which the corona is filled with ruffles. Some varieties are fragrant (most notably the jonquils), while many others have no scent. Stems may hold one large blossom, or clusters of two to six smaller flowers. It is thought that the common name, daffodil, is derived from the Old English word affodyle which means, “that which comes early.” Daffodils, depending on variety, bloom in March, April and May. The scientific name, Narcissus comes from the Latin word narkeo which means “to be stupefied”. Narcissus bulbs are poisonous. They contain lycorcine, a chemical that paralyzes the heart and numbs the nervous system. Narcissus are native to Europe and the Mediterranean. 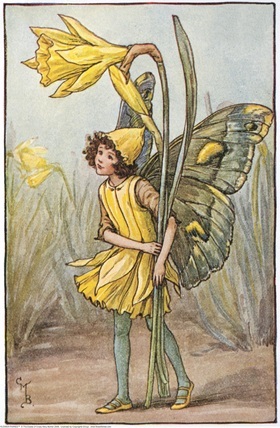 Narcissus pseudonarcissus, the Wild Daffodil, is one of the national emblems of Wales. Jonquils, a type of narcissus consisting of clusters of several small flowers per stem, were much loved by Queen Anne of England. It is said that her love of these flowers inspired her to create Kensington Palace Gardens, which was the first public garden in England. Daffodils were brought to America by the British colonists. Thomas Jefferson, an avid gardener and pioneering horticulturist, among his many other achievements, planted several species of narcissus at both of his homes, Monticello and Poplar Forest. Daffodil plants are very easy to grow. Plant them in full sun or partial shade in well drained, moderately fertile soil. Set in flower beds, along the front walkway, under deciduous trees (where they will receive needed sun before the trees leaf out) and in the vegetable/cut flower garden. Narcissus varieties are a good choice for gardens exposed to deer populations. Whereas tulips are candy to them, they do not like the taste of daffodils and leave them alone. Bulbs are planted in early autumn, usually four to six inches (10-15 cm) deep, or twice as deep as they are tall, and spaced at least a bulb width apart. For a natural look, stagger the placement of the bulbs. Since it is best to plant at least a dozen or so bulbs for an effective display, it may be easiest to dig a large hole and place them in all at once with the roots down and tips facing up. Gently and firmly add soil around them. It is possible to add a layer of crocuses or grape hyacinths (at a depth of three inches/7.6 cm) above the daffodil bulbs. Water after planting and regularly until frost. It is most important to cut the flower stems after the blooms have faded (unless you are growing the plants primarily for the seeds) and to allow the foliage to remain in place until they have naturally turned yellow, which usually happens in June. This is common advice given when you read about the planting and care of daffodils and all bulbs for that matter. The reason being is that the leaves create food that is stored in the bulb so that next year, magnificent blossoms will again appear. If daffodils and other hardy flowering bulbs are thought of as perennials, which they are, it is easy to observe this practice and even question why it is so often stated. The reason may be that in public settings, landscapers cut the foliage back after flowering and immediately plant annuals to keep the floral display going. When the plantings of daffodils become dense with foliage it is time to divide them. This may be done once the foliage has turned yellow, or in early autumn (be sure to mark the location in the spring.) Gently dig them up, separate the bulbs which have grown off the main bulb and plant them in a new location or give them to a friend. Once you have an ample supply, be sure to cut some and bring them inside to enjoy, just as A. A. Milne did. Note: This article was written by me for the blog 12 Months in View. A bibliography of the reference books I used is available upon request. My Thanksgiving Cactus, Schlumbergera sp., blooms in mid November and often again in early spring. Here are some photos I took today. It is my understanding that cool evening temperatures trigger flower buds to form. Evening temperatures have remained consistent all winter indoors, therefore I suspect that day length must play a role as well. Buds began forming about a two weeks ago which is about 8 weeks after the first day of winter. If I approximate when buds began to form in the fall, I would say that it was roughly 8 weeks before the first day of winter. Nice to have it in bloom again. As part of a year long on line art journaling challenge which begins this month, I will be posting photos of 4 garden areas on the approximately the same day each month and from the same vantage point. This is what those areas look like today. On February 8 and 9th, my area of the country experienced a blizzard that left snow in amounts that broke records. We received over 30" of snow! Since that blizzard, daytime temperatures have remained above freezing. Little by little the huge piles of snow began to melt. It isn't totally gone yet, but enough of it is that I can see some perennials showing signs of life. How delightful!